Wigs / Blog | All about Wigs / Why You MUST Try Dark Roots This Season! Hairstyles in 2018 have been all about authenticity, and the latest dark root fad is no exception! If you color your natural hair, you know that dark roots are the annoying consequence of your chic color selection: after a certain amount of time, your natural hair color starts coming in, disrupting your preferred dyed style. And for a long time, having your true roots on display was seen as a major styling faux pas. ● Avoid any harsh contrasts! Your roots should blend nicely with your new hair color. You’ll want only a shade of difference, or a slow transition from one color to the next (the sombré technique is a great option). ● Work with your hair stylist! Your stylist can advise you on how best to style your hair and makeup, and let you know if any additional coloring is necessary. ● Pick the right wig! If you want to try dark roots, you’ll have to decide whether you want synthetic or human hair dark rooted wigs. If you want a synthetic wig, you’ll want one that has been pre-dyed and styled (to be sure of high quality results, you probably shouldn’t dye a synthetic wig). If you pick (or already own) a human hair wig, you can dye your hair however you choose! And that’s it! Read on to learn why this style is absolutely perfect for the winter season—and more importantly, absolutely right for you! Contrary to the old stigma, dark roots can look seamless, natural, and simply beautiful for almost any facial shape or skin tone. Roots have the unique ability to add depth and dimension to your hair—not to mention an eye-catching vibrancy! Whether you’re aiming more for actress Margot Robbie’s posh, glamorous dark roots or for the relaxed, casual vibe of Drew Barrymore’s devil-may-care dark rooted hair, you’ll feel cool, calm, and collected in your new ‘do! Most wig wearers want their wigs to seem natural and look as close to real hair as possible. Dark roots help create that illusion! If you’re looking for a dark rooted human hair wig to hone in on that natural look, channel actress Hilary Duff and try Ellen Wille’s mid-length, sandy blonde Emotion. For styling, I’d either go with stick straight locks or light, simple waves! Dark roots give you that modern two-tone style without all the effort and upkeep! There’s so many trendy styling and coloring possibilities for dark rooted hair: shadow roots, ombrés, balayage, glazes, extensions, or even a quick dye blend can achieve your desired look. But you can also just let your natural hair grow in as your dyed hair fades and look chic without spending a fortune! If you have any hard lines of demarcation (say you went platinum from dark brown) then it's always pretty to add in some highlights to make the transition smooth. During the winter season when it’s snowing and freezing cold outside, the last thing you want to do is make routine hikes to your preferred salon. Dark roots are all about embracing your laziness—just let your hair do what it does naturally! 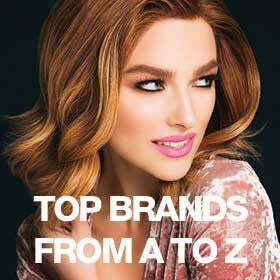 But if you’re planning on wearing a human hair or synthetic wig, your chic look will be set in stone all winter long! My personal favorite synthetic dark rooted wig is Envy's Angie. There are several rooted color options for this wig, our favorite being Chocolate Cherry with its dark brown roots, medium brown base, and deep red highlights. And since it’s a lace front wig, you still have plenty of unique styling possibilities! Tis The Season For Two Toned Wigs!